Disclaimer before I start: Yes, I am sponsored by Gearbest. My recent review (Xiaomi water leak sensor) was send to me. Most of the new products will also be sponsored by Gearbest, For all the other reviews, I paid for the products myself. I already had 6 pages of orders before I wrote any review or received any product. I am just a student writing down my thoughts, so the sponsorship really helps me out. As you expect, shipping from China takes a while. On average it takes about 22 days to ship to Europe and 19 days for America. You can pay for faster shipping but most of the time this is quite expensive. Some products are not only available from the China warehouse, but also from other warehouses like GW (EU) Warehouse, multiple in the United States, Russian and more. The GW Warehouse ships to Europe within 7 days and almost no chance on getting import fees. Even if you happen to get these fees when ordering from the GW Warehouse, you can contact the Gearbest support and get it reimbursed (if you have the receipt). 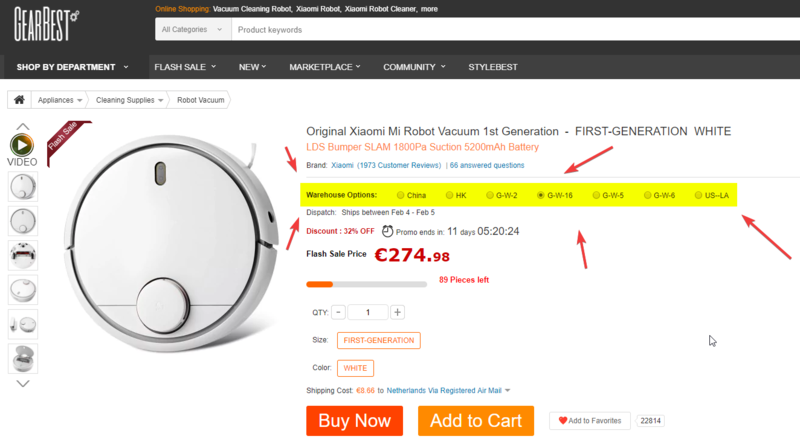 This way you can order expensive products without worrying about import fees, like the Xiaomi vacuum below. This is one of the big reasons I get my big orders from Gearbest and not other sites like AliExpress, I just cannot be bothered with paying extra for the import fees. At the ‘Warehouse Options’ you can choose from the available warehouses for that product. The price for shipping is based on weight, size etc. You can find the specifics on their own shipping page. I already talked a bit about import fees in the paragraph above, but here I will shed some more light onto what it is and why you should care about it. Import duty is a tax collected on imports and some exports by the customs authorities of a country. It is usually based on the value of the goods that are imported. Depending on the context, import duty may also be referred to as customs duty, tariff, import tax and import tariff… There are two distinct goals to import duties: to raise income for local government, and to give a market advantage to locally grown or produced goods that are not subject to import duties. To put in in an easy way: if you buy anything from another country (for EU, mostly anything outside of the EU) you will have to pay ‘import fees’. If the order price exceeds a certain amount, varies from country, you will need to pay import fees before you get the package. This is often something around 15 euro administration costs and something around 3-4% (depends on country and product), these are quite some extra costs that you ofcourse do not want! When people hear this, they are often scared to order products from China. You can sometimes ask the seller to write down a false price on the package, but this does not always works and your customs will just ask you for the receipt (which you can not falsify that easily). Gearbest has multiple warehouses in different countries. This way they can offer products from not only China, but also EU (aka England), LA, Brazil and more. If you buy products from the GW(EU) Warehouse, the chance in import fees is almost impossible. If you happen to still get fees, you can just contact the support and ask for a reimbursement. Another really nice bonus when ordering from the GW Warehouse, is that you get way faster. Gearbest promises that most orders get there within 7 days (and in my personal experience, it only took 3 days). The downside is that some products are only available from the Chinese warehouse, or that they cost more than the Chinese warehouse. Ordering from the new warehouses is a good fix to the problem, but for the following reasons it might not be your perfect solution: product is not available from that warehouse or the product costs quite a lot more cash compared to the China warehouse. For those people they have an alternative (maybe even better for some situations) fix, and that is to choose the ‘Priority Line’ shipping method for your order. If you choose that option, Gearbest can reimburse the import fees (if you have a receipt to prove it!). If you happen to get the import fees, but you have ordered with Priority Line. You can contact the Gearbest support, show the receipt and they will reimburse the fee! This is new and all the orders since 1 december 2017 can get it reimbursed, I think this is actually really cool and I hope other companies will follow this policy (BangGood please). The downside compared to the warehouse is; the shipping takes quite long, compared to the within 7 days that warehouse offers. Is there warranty on my products? If for some reason you do not want your item anymore (not opened or used in any way), you can return in within 30 days and get a refund. Item has to be in the original package and you have to pay the shipping. If they shipped the wrong item, they will either refund or give you an alternative item. Gearbest will decide if you have to send the wrong item back, and if you have to pay for the shipping fees to send it back.